I’ve had a lot of people asking for help setting up a Ruby on Rails environment recently so figured I’d put a post together detailing how I set up my boxes. This won’t be a guide for everyone, but it’s a tried and tested setup that not only performs well, but is also well set up to work with most gems and the development tools you’ll want. This guide covers both development and production environment setups. Or: How I learned to give up on projects. Okay, so, Backchat was hugely interesting as a project. 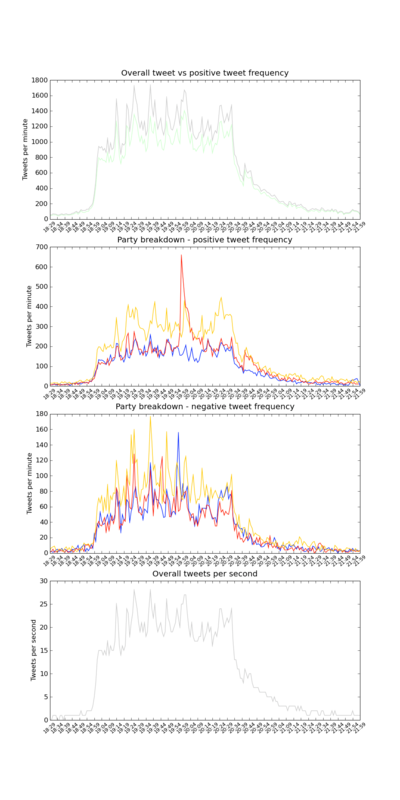 Eventually, I produced a set of graphs using the classifier that showed sentiment over time. These graphs aren’t too accurate but are fairly good at showing how things were going. However, after this I pretty much dropped the project. This was mainly due to exams cropping up and stealing my time away, but also because of how difficult it was to approach a sensible level of accuracy. In my ‘final’ design I ended up using a bigram classifier. I added parsing of the tweets to pull out mentions of words, URLs and users, and then used this to generate my training sets, which improved things a lot. This gave me several thousand tweets for each training set, which worked okay. However, even with this classifier, which was doing a lot better than most others, my results weren’t very reliable on a tweet-by-tweet basis. Still, it wasn’t too shoddy, and the graphs on the right are fairly reliable I think in terms of general sentiment. The AMQP-linked network of processors worked extremely well, and resulted in good throughput- I used two parsers, two classifiers and one classifier loader in the end; I was unable to achieve realtime performance due to network constraints. Sadly my ISP at home had decided that I’d used too much bandwidth and clamped me down to 128 kilobits a second. That said, thanks to the streaming API I did not (as far as I know, except for a few hundred to ratelimiting) lose any tweets, I just received them out of order and then reconstructed the correct order using the timestamps for each tweet. The machine I was using for this also pretty much went flat out on disk I/O and CPU usage, but was able to keep up- it’s a fairly old box, only a Pentium 4 with a couple of gigs of RAM. In any case this was an interesting project and I’ll be open sourcing the data and source in the coming weeks if anyone wants to have a poke at it. While the debates are now gone and done, I’m sure people can come up with some great uses for sentiment analysis outside of UK politics.